Professor Kazuhiro Yoshida, Director of CICE has been elected co-chair of SDG-Education 2030 Steering Committee, the global multi-stakeholder coordinating mechanism of SDG4, at its special meeting held in Brussels last week. The term is for two years of January 2019-December 2020. 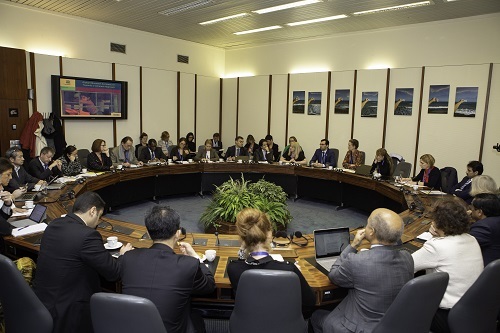 The steering committee has 38 members (to be increased to 44 next year) represented by UNESCO’s member states, civil society, multilateral organizations, teachers, private sector and youth. The co-chair, together with another co-chair Ms. Stefania Giannini, Assistant Director General of UNESCO, will perform extensive roles including liaising with United Nations and other SDGs representatives, as an international “face” of SDG4. His election is expected to contribute to the promotion of SPLENDOR PLAN 2017, the Hiroshima University’s vision which commits itself to establish peace science that will lead to sustainable development.